A national treasure, hero and amazing actor is leaving his role as a satirical mirror of the conservative pundit to another stage. Stephen Colbert has been a political jester the likes of which the world hasn't seen since Diogenes the Dog and tonight is his last show. For 9 years this entertainer has acted as an iconic personality and affected American politics far beyond any fictional character in history. Tonight is Stephen's last Colbert Report and America is losing a needed voice in the political conversation. Over the past 9 years the brilliant host of the Colbert Report has played the part of lampooning conservative punditry. On the national stage this entertainer and joker had played his part so well that he managed to convince House Majority Leader Nancy Pelosi to first advise colleagues against going on the show, to jokingly campaign against his Super Pack, to later debating him on his own show, and finally appearing in his send off. Stephen Colbert taught us the Elven language, that it was OK to argue with ourselves, why bears should never be trusted, and tried to bring the funky Cornel West to a different audience. The Colbert Report helped us all better know our political districts, "bumped" some serious academic guests, and even introduced me to one of my heroes of the ocean, Dr. Sylvia Earle. One shark scientist even made the claim that "Stephen Colbert Is the Best Source of Science on TV." The article in question asks if the move to CBS will "dumb down" his programming. I share that fear. 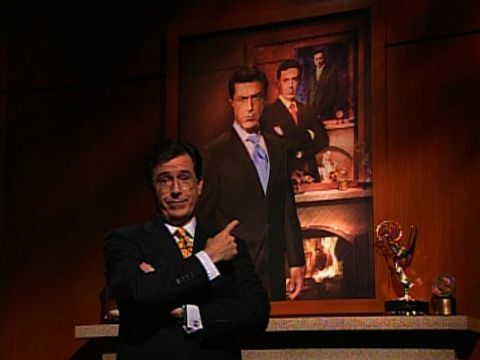 Colbert hosted the 2006 Presidential Correspondents Dinner (roasting President W. Bush in the process) has won Grammys, Emmys and even two Peabody Awards. Stephen Colbert pointed out the absurdity in the hubris in our policies and even taught American's about an interesting concept in campaign finance, the Super Pack.This program was not only consistently hilarious, but it was also provocative and educational. Colbert is an amazing interviewer and that will follow no matter where he goes. His subject matter and his guests will likely be more akin to the fluff of other late night T.V. and far less impactfull on National discourse. In many episodes, Stephen Colbert goes toe-to-toe with the political leaders and heads of state with barely breaking a sweat like Newt Gingrich and Laura Ingraham. He opened up his image for the larger community through releasing a "green screen" challenge. In one particularly interesting situation Colbert covered the issue of migrant worker's conditions and later testified before Congress in character. The program, by pointing a finger at the hilarious underbelly of the political system, Stephen Colbert changed it. By making himself part of the political narrative, Colbert also put himself in a corner. He had to consistently play the same character, probably even in public, for 9 years. This level of commitment and obsession will be missed. I am happy for Stephen in the fact that he will be replacing David Letterman for the prime, late night TV spot. I am sad for America because we will be losing a key voice in the political discourse who brought up the level of our culture, our scientific awareness and our awareness of the absurdity around us. Shine on you crazy Stephen Colbert, you will leave America a slightly less politically educated place but I am positive the hilarity will ensue.